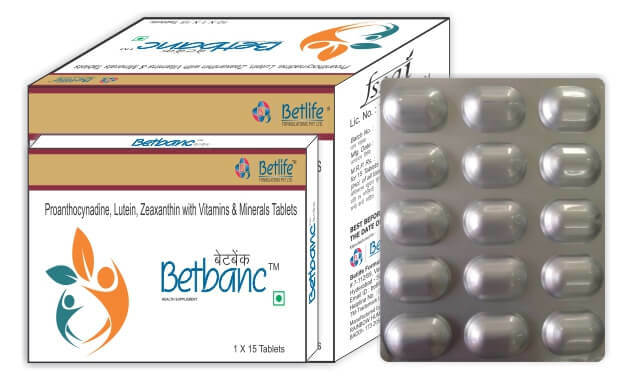 This is the combination of nutritional product that contains Zeaxanthin, Lutein, Grape Seed Extract with vitamins and minerals, beneficial for maintaining eye health and good vision. As their name suggests, eye supplements are designed to add to, not replace, nutrients you get from a healthful diet. Taking dietary supplements cannot completely make up for serious nutritional shortcomings of a poor diet and too much junk food, which are associated with many serious health problems, including vision loss. Benefits of vision supplements are in reducing the risk of eye problems (and perhaps in improving visual acuity in healthy eyes). Human eye requires targeted nutrition to support healthy tissue and clear vision. Our vision is a precious sense, and one that we should not take for granted. While we may supplement our diets with nutrients to enhance our overall wellbeing, we tend to overlook our eyesight as a necessary part of our health to maintain. So good nutrition is important to keep our eyes healthy and functioning their best throughout your lifetime. This vision smart complex is a unique blend of nutrients - Zeaxanthin, Lutin, Grape Seed Extract with vitamins and minerals which support and replenish antioxidant levels in your healthy retinas and macula and protect against UV damage. It supports healthy vision and supports healthy blood vessels in the eye. In this supplement, Lutein and Zeaxanthin are very important nutrients which may reduce risk for macular degeneration and cataract and which combined together for their effect on improving eye health & function. Found naturally in the human eye, these two carotenoids filter out high-energy blue light from the sun that can harm the macula lutea, the part of the retina that sees detail in the center of your field of vision. Lutein and Zeaxanthin supplements can act like a pair of sunglasses for the macula lutea, filtering some high-energy light exposure, lowering Age-related Macular Degeneration (AMD) risk, and improving visual acuity. They also may help with night driving and computer use by improving contrast sensitivity and glare recovery. And they prevent oxidative damage, potentially thwarting dry eye and cataracts. Leutin and Zeaxanthin play a role in preventing macular degeneration or reducing the risk of progression of the diseases and protect the retina. Grape seed extract may help prevent or slow the development of macular degeneration. Vitamins B complexes (including vitamins B1, B2, B3, B5, B6, B12, Folic Acid, Biotin) may help reduce chronic inflammation and prevent elevated homocysteine levels in the blood, which have been associated with vascular problems affecting the retina. B vitamins also may play a role in reducing the risk of macular degeneration and in the treatment of uveitis, a common cause of blindness. Vitamin C a powerful antioxidant is associated with reduced risk of cataracts. Vitamin D lowers the risk of macular degeneration. Vitamin E reduced risk of cataracts. Copper improves eye health and helps to inhibit the progression of advanced age-related macular degeneration. Chromium relieves intraocular eye pressure. Magnesium prevents glaucoma and improves vision. Manganese is important for eyesight and enhances the ocular functions of the eye. Selenium prevents free radical damage to the lens and macula. Zinc, helps support the retina, where it's more concentrated than in any other organ and antioxidant protection. So this excellent product formulated to support your normal eye health and visual acuity which protect and support a lifetime of eye health. Zeaxanthin is a structural isomer that belongs the carotenoids family. Carotenoids are synthesized by plants for coloration and absorption of light. Zeaxanthin increases low macular pigment levels – a leading risk factor for AMD and protects eyes from harmful blue light induced photo-oxidative stress. Zeaxanthin helps sustain the health of your lenses, photoreceptors, and retinal lining. Zeaxanthin prevent macular degeneration, the macular pigment is highly organized within the retina of the human eye. Retina contains two carotenoids, lutein and zeaxanthin, with the greatest concentration at the center. Within the central macula, zeaxanthin is the dominant component, up to 75% of the total, whereas in the peripheral retina, lutein predominates, usually being 67% or greater. So, zeaxanthin increase the macular pigment. Zeaxanthin also plays a role in visual performance. It forms a filter (macula pigment) over the part of the retina responsible for detailed vision. This filter blocks out blue light and haze from strong light, which in turn increases the eyes' tolerance for bright lights. Supplementation with the macular pigments has the potential to improve vision in our daily lives, particularly when our eyes are challenged by intense light such as glare from the sun, a camera flash, or blinding headlights at night. Lutein, the powerful antioxidant which gives fruits and veggies a yellow color, helps protect your eyes from damaging light. Everyone is born with some lutein in our eyes, but we stop producing it. Lutein has been referred to as, "the eye vitamin" because of its ability to prevent or slow some eye conditions. This is a highly essential supplement for eye health; lutein forms a protective shield and prevents formation of cataracts as well as macular degeneration in the eyes. Lutein is critically important for your eyes. This essential carotenoid has been researched in numerous clinical studies and shown to support the health of the macula, support vision under low-light conditions, and protect your eyes against oxidative stress caused by harmful blue light. Grapes have been an integral part of human culture and cuisine for thousands of years. Grape seeds, chock full of powerful antioxidants, have caught the interest of scientists and the health-conscious public and may offer benefits for a variety of health conditions, including some related to visual health. Grape Seed extract (proanthocyanidins) may be beneficial in many areas of health due to its antioxidant effect. Grape Seed Extract has the ability to bond with collagen; promotes youthful skin, cell health, elasticity and flexibility. Antioxidants in grape seeds protect cells in the retina, which are responsible for your ability to distinguish colors and to see in low-light conditions. In the tissue culture study, grape seed extract quenched free radicals, reversed oxidative damage and protected retinal cells from stress-induced early demise. Grape seed extract, a bioflavonoid, is a potent antioxidant. Plant-derived bioflavonoids are readily assimilated into our body when consumed. Bioflavonoids appear to protect retinal ganglion cells. Eyes are one of the most important organs of the body, and it is important to maintain healthy vision and protect the eyes from vision impairing diseases through optimum intake of B vitamins. B vitamins also function effectively to improve eyesight. B vitamins also improve blood circulation in eyes and reduce the level of amino acids – a leading cause of vision loss. Regular intake of B vitamins reduces the risk of glaucoma and cortical cataract. These vitamins prevent eye diseases such as cataracts, glaucoma and macular degeneration through a well-balanced diet rich in nutrients that also helps in improving eyesight naturally. Vitamin B1: For vision problems such as cataracts, glaucoma. Vitamin B2: Vitamin B2 plays a major role in ensuring healthy corneas and perfect vision. It is beneficial to the cornea in the form of an eye drop. Its deficiency lead to dimmed vision, along with red, itchy, burning eyes. Vitamin B3:It is useful for increasing the flow of blood to the optic nerve. Vitamin B5: Prevents nerve and optic degeneration. Also helps in preventing age – related macular degeneration. Vitamin B6: Protects eye health. Helps the prevention of eye disorders and loss of vision and slow the onset of certain eye disease, including age – related macular degeneration. It also helps absorb magnesium, which is used to help the production of tears. Vitamin B9: Improves vision and important for cell growth. Biotin: Important for healthy eyes. Mecobalamin: Important for optic neuropathy and increased vision. Vitamin C may reduce the risk of cataracts and macular degeneration. It works with vitamin E to protect the tissues and improve eye health. As an antioxidant it protects cells from harmful chemicals, prevents cataracts, strengthens capillaries and helps maintain the shape of the cornea. Vitamin C also helps prevent cataracts from developing due to UV radiation and oxidative stresses. It is used to prevent glaucoma as well as for the maintenance of collagen tissue in the eyes. The powerful antioxidant property of vitamin C protects the eye against harmful chemicals and toxins, improves the health of capillaries and relieves eye pressure related to glaucoma. Vitamin D contributes to a reduction in developing macular degeneration. A deficiency in Vitamin D can lead to blurred vision and problems with focusing the eyes. Regular absorption of vitamin D through sun exposure or from foods and supplements can prevent macular degeneration, reduce inflammation and improve vision. Vitamin E is a powerful antioxidant that revokes the damage caused by harmful free radicals and oxidative stress and protects the retina. Deficiencies can cause abnormal eye movements and impaired vision. Vitamin E also reduces the risk of cataract, age-related macular degeneration and impaired vision. Copper is essential for the production of collagen, a component of connective tissues. It improves the eye health and helps to reduce the development of advanced age – related macular degeneration. Copper also enhancesthe functioning of the antioxidant enzymes in the eye and important for vision. Copper, acting as an antioxidant, encourages the development of flexible connective tissue for proper eye structure. This essential trace mineral is extremely important in relieving intraocular eye pressure which is becoming an increasingly common problem with the increase in computer-centric work that puts strain on the eyes. Chromium may improve vision as it plays a role in muscle contraction, which helps to focus the eyes. A healthy level of chromium in the body helps maintain balanced intraocular pressure in the eyes. Protects against glaucoma and has even been known to improve vision in people who already have glaucoma. It is also important in nerve conduction, dilating blood vessels and maintaining blood flow to the eyes. Manganese is essential for the proper functioning of an enzyme, absorption of nutrient, wound healing, and development of bone in the body. Manganese enhances the ocular functions of the eye. Selenium is an eye health supplement that is a good source of natural antioxidants and can be easily consumed as a supplement. It is known for boosting the immune system and fighting off infections, this antioxidant helps to prevent cataracts and macular degeneration by reducing free radicals that can damage the eye. Selenium functions as a powerful antioxidant for fighting infections and boosting the immune system. It prevents free radical damage to the lens and macula. Low levels of selenium in the body have been shown to increase the risk of developing cataract and macular degeneration. Zinc is present in extremely high concentrations in the retina and is a good antioxidant. It helps to maintain proper eye functioning. Zinc has been shown to slow down the onset of macular degeneration. It also protects tissues and strengthens eye cells. Protecting against swelling and cloudiness of the cornea is another function of zinc. Zinc plays an integral role in maintaining the functions of the eye and the macula of the eyes have the greatest concentration of zinc compared to any other organ. It converts the beta-carotene derived from vegetables into vitamin A. It is required for improving the optic cells and strengthening the tissues and muscles of the eye. Pregnant and lactating mothers should not take any single supplement in higher – than – normal doses unless recommended by a health – care provider for special conditions. The combination should only be used in pregnancy and lactation if benefits outweigh the risk.